In his latest stand-up special, Patton Oswalt has a hilariously bit that should be instantly relatable to parents of toddlers: He puts on Dora the Explorer for his daughter because he needs some uninterrupted time to get some work done. To his chagrin, the show opens with, “This episode of Dora The Explorer will teach your child about how to make a pipe bomb and the dangers of race mixing.” What’s a parent to do? On one hand, your daughter might end up a white supremacist terrorist. On the other hand, laundry doesn’t get done for the third day in a row. It should come as no surprise to parents of toddlers that he chooses to do his work and decides to have a talk with his daughter at some other time. Of course, this is an exaggerated take on how desperate parents can get when they need to do anything substantial while also tending to their toddlers. I’m the father of a three-year-old girl, so unless I find a way to get her distracted by something for longer than five minutes, I have to forget about getting anything done since she requires constant attention regarding the most trivial of matters. Example: One day last week, we spent half an hour repeatedly counting how many cushions our couch has. It has five. That’s where TV shows come in, since they provide the perfect excuse to glue our toddlers to the flat screen, sometimes for hours at a time. Since I work from home as a freelance writer, I’m often tasked with pulling double duty as Paste Magazine Listmaker Extraordinaire and Stay-at-Home Dad. I find myself having to frequently place my daughter in front of the Kids section of Netflix. After all, massive and impressive lists ranking almost all Stephen King movie and TV adaptations won’t write themselves. Yes, Netflix is a lifesaver in those occasions, but you also don’t want some vapid piece of fluff that does nothing but overload your toddler’s eyeballs with bright colors. That’s fine for an occasional time waster for 7- to 10-year-olds, but a toddler’s mind is still soaking everything in like a sponge, so the perfect show for their age group should be educational as well as entertaining and aesthetically pleasing. It’s important to cultivate a sense of adventure and exploration in our little ones, and this plucky and energetic show finds a nice balance between dealing with everyday social issues that kids face, and how they can find inspiration to solve those problems through imagination. The show revolves around Justin and his helpful shape-shifting friend, Squidgy, who take everyday encounters and turn them into epic adventures while teaching kids about the importance of exploring nature and learning about other cultures. The colorful CG animation finds an attractive middle ground between 3D and more traditional 2D. This adorably low-key Irish show is perfect for toddlers who don’t have an older sibling, and are looking for such an authority figure to show them how to navigate their confusing world. Each episode of Puffin Rock lines up short vignettes where two friendly and caring puffins, Oona and her little brother, Baba, learn to empathize with the creatures around the tiny coast they call home. Oona is a perfect big sister, guiding Baba through their adventures as they learn about fascinating new creatures. The watercolor storybook look is gorgeous and should immediately attract the little ones. Any parent of a toddler will tell you that if those little bundles of joy would have a catchphrase, it would be “Why?” This is the age when kids want to learn about absolutely everything around them, no matter how random or how much it just makes common sense to us. That’s why Ask The Storybots is an essential show for them. Each episode answers a wide variety of common toddler questions, like “Why does night happen?” and “Why must I brush my teeth?” It then uses a bunch of curious little robots to take them on a surprisingly detailed journey to provide the answers. The design of the robots is refreshingly simple, and the show does a great job of inspiring artistic creativity by mixing various styles of animation. When it comes to toddler edutainment, you can’t go wrong with The Jim Henson Company. Word Party is an essential tool in teaching the alphabet and basic spelling for preschoolers. It follows a group of anthropomorphized animal babies as they learn various words, while also teaching their little audience about how to handle conflict in confusing or overwhelming social situations. The 3D animation is very simplistic and has that cheap, plastic CG look, but the tender and heavily researched way the show teaches spelling and correct social behavior makes it worth your kids’ time. At first glance, Luna Petunia looks like one of those emotionally and intellectually vapid “princess” shows aimed at little girls, complete with a gaudy aesthetic made up of random color explosions and an overreliance on anything materialistic and shiny. However, upon further research, it turns out to be a very useful piece of edutainment when it comes to teaching toddlers basic problem-solving skills. In each episode, the perky Luna enters her dreamland and encounters various issues that must be resolved with help from her Wizard of Oz-inspired cadre of fantastical creatures. The way each episode hangs onto the importance of taking a breath and calmly thinking of a solution provides an emotional outlet for children, especially for those struggling with anxiety. Toddlers, by their very nature, can usually only grasp absolutes. They either want all of something, or none of it. Compromise and moderation are not yet in their vocabulary. Kazoops! is a fun little show about the boundless musical imaginations of a little kid and his pet pig that also deftly educates children about how nothing is really black and white. Each episode begins with the kid wishing for a selfish extreme, like getting everything he wants whenever he wants it. This then leads into a musical number where he gradually figures out the many negatives of such a prospect. The character design is simple, but should be relatable to the little ones. Pocoyo is a perfect show for toddlers who might be overwhelmed with too much visual information on the screen. The calming minimalism of this Spanish-British co-production is what makes it such a valuable addition for your young kids’ screen time. In front of an all-white background, each episode shows cute little Pocoyo, a fairly archetypal little boy, finding common ground with his animal friends after dealing with a social conflict that toddlers find themselves in pretty much every day. The show is efficient in the way that it advocates for finding common ground in order to make peace with friends we might not agree with at the time. Perhaps Pocoyo is not just for little children. Maybe our world leaders could benefit from watching it as well. Apparently Sarah and Duck, about the curious title character and her loyal duck exploring their quirky neighborhood, has a surprising number of adult fans. This doesn’t surprise me, since the show’s lovingly plain hand-drawn look, its serene minimalist score, and the adorable characters work as a natural form of anti-anxiety. Toddlers who are missing playing with their friends, looking around their immediate surroundings with their own unique perspective and filled with unbound curiosity and imagination, should find a lot to love about this British show. As inefficient and downright stupid as the concept of playing Mozart to pregnant bellies turned out to be (George Carlin said it best: “It sold a lot of CDs, and pissed off a lot of fetuses!”), there’s still a lot of merit in exposing toddlers to classical music. 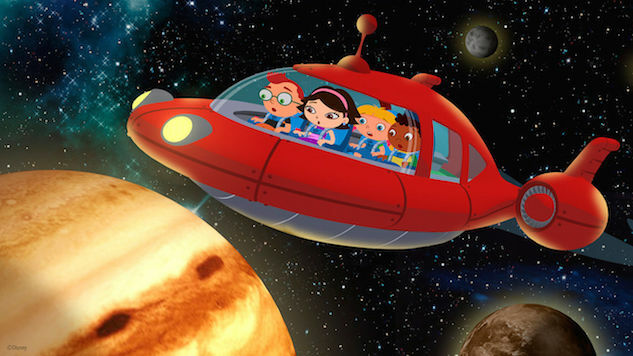 Taking a page out of The Magic Schoolbus’ playbook, Little Einsteins finds a group of curious kids using their magic size-shifting spaceship to go anywhere, no matter how small or big, to teach children about the various facts of the universe. They use famous bits of classical music to innovatively tie whatever culture or place they’re teaching in any given episode. In an age when tablets and smart phones provide ceaseless A/V distractions, one of the biggest concerns for parents is whether or not they’ll be able to instill the importance of books into the always-developing minds of their children. Super Why! is one of the most valuable shows on Netflix because of its infectious passion for teaching through books. Each episode shows a ragtag team of bookworm kids who use the power of the alphabet to solve various problems. The show has a meticulous and patient pace in the way it invites the audience to participate in spelling various words or learning about a wide variety of books.